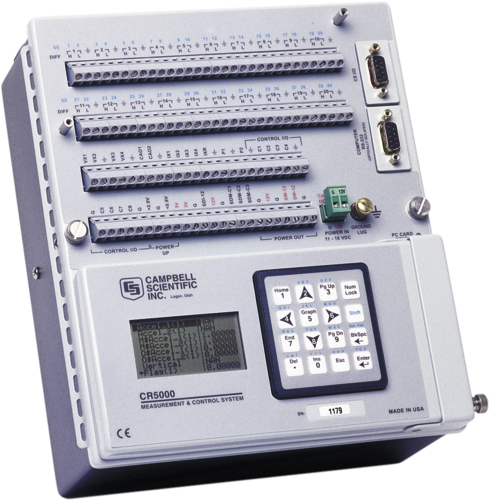 Note: Although the CR5000 is a retired product, the same performance can be achieved using a CR6 Measurement and Control Datalogger with a CDM-A116 (16-Channel 5 V Analog Input Module). The CR5000 is a rugged, high-performance data-acquisition system with built-in keyboard, graphics display, and PCMCIA card slot. It combines 16-bit resolution with a maximum throughput of 5000 measurements per second. It has many input channels and can measure a large number of sensors. This makes the CR5000 a key part of automotive, structural, and high-speed environmental applications. How many sensors can be connected to a CR5000? It depends on the nature of the sensor output. The CR5000 has 20 differential analog inputs or 40 single-ended analog inputs. In a CR5000, can a control terminal be configured as a pulse terminal? Yes. All eight control terminals can be used as pulse terminals. Does a CR5000 need a 4WPB100 to measure the internal RTD of a 4-way net radiometer? No. The CR5000 has a precision current excitation terminal. An RTD can be measured using a single precision current excitation terminal and one differential analog input terminal. Why might a CR5000 suddenly lose connection via an RS-232 port with a computer running LoggerNet? It is possible that the RS-232 cable was disconnected from the PC by accident.